Imagine a bank without bureaucracy, lines, a lot of paper and a lazy attendance. This is Neon. We left the runaround and the fine print out and we decided to create a new bank. With Neon you leave in the past the most hated things about your bank. We're with you 24 hours a day, always in your pocket. Your Neon account has two international cards that you can use in every place around the world. What you can do with your Neon account? 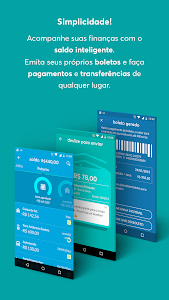 Send and receive transfers of all banks. Let the long lines in your past. Open your account and know a totally different bank. The informations about your money will always be in your hands. In our app you will always know what's happening with your Neon account. We do not hide our rates in fine print. We're always searching for transparence about your account and our bank. 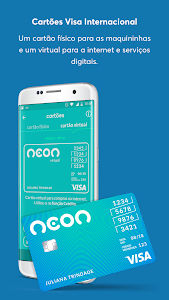 With Neon account you will receive two cards: the 'real' one and the virtual one. Both are Visa cards and can be used in every place around the world. The 'real' one must be only used as a debit card. The virtual card must be used only in the internet and as a credit card. But remember! It's a debit card and the whole value of your transaction will be debited at the time of your purchase. We do not charge for tuition. You can check our rates at any moment. They're only a few and way less expansive than the other banks. The first withdraw of the month will always be free! And the money transferences of Neon account to another Neon account don’t cost anything. 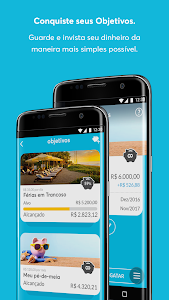 We believe that the time for you to your bank left in the place he has come deserve. Internal improvements and bug fixes. 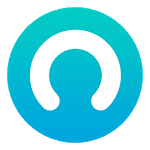 If you're experiencing any issue or have a question about the app, sent an email to [email protected] or start a chat inside the Neon app. 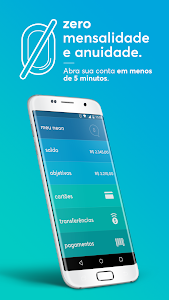 Similar to "Neon - Digital bank"